For Better or For Worse: The Complete Library, Vol. 2 is Available! Our second treasury book, The Complete Library, Vol. 2 is out now! Order it today from IDW Publishing, or check your local bookstore. (We won’t be carrying it in our online store – the sheer weight of this book makes it too expensive to ship from Canada). Since their debut in 1979, the world has watched the Pattersons grow up in real time—and to many readers, they feel like family. The cast expands, and roles that will play a big part down the road are just starting to bud. New adventures await Elizabeth as she enters kindergarten and has to spend some time in the hospital. Michael has to deal with a bully at school and takes a flight to Vancouver—all by himself! John has an unfortunate accident and is arrested for breaking and entering! And Elly finds a worthwhile cause in heading up a campaign to save the historic city hall that has been scheduled for demolition. Volume Two collects the complete daily and Sunday comics from January 1983 through July 5, 1986, with all Sunday comics printed in color. This entry was posted in News and tagged idw publishing, The Complete Library, treasury book on July 19, 2018 by fborfwnews. Do You Collect Comics Clippings? Can You Help Us? As IDW Publishing puts together the next of Lynn’s treasury books, we’re looking for some help to re-create the vintage colouring from when the strips were originally published, in 1983 and 1985. We’re missing some parts of specific strips – here is a list of dates, below, followed by images of the strips in question. Thanks for looking! We’ll be very grateful if you can help us locate the colour references! – Lynn and the team. This entry was posted in News and tagged clippings, idw publishing on March 14, 2018 by fborfwnews. 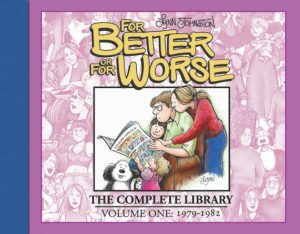 For Better or For Worse creator Lynn Johnston and Editor Kurtis Findlay will be on hand to sign copies of the brand new For Better or For Worse, The Complete Library, Vol. 1: 1979-1982, published by IDW/Library of American Comics. This entry was posted in News and tagged book signing, idw publishing, treasury on October 21, 2017 by fborfwnews.